Fresh cracked egg (beaten, seasoned & baked) with your choice of meat & cheese. On your favorite grilled bread. Half Sandwich- All natural Peanut Butter and Grape all fruit spread sandwich; Grilled cheddar cheese sandwich; Ham or Turkey; Chips or Applesauce, White/Chocolate Milk (or small fountain Drink) & your choice of Cookie. Turkey, pepper jack cheese, Chipotle Greek Yogurt spread, avocado spread, thinly sliced cabbage & pickled red onions on toasted San Francisco sourdough bread. Turkey, crispy bacon, avocado spread, Romaine lettuce, tomato, red onion with bleu cheese spread on Honey Whole Wheat bread. A New Orleans Classic ���������������������������������������������Ham, Pepperoni, Salami provolone cheese, Olive tapenade, garlic herb spread, banana peppers, steamed & toasted on Focaccia bread. Turkey, Pepper Jack cheese, roasted onions & peppers, Romaine lettuce, tomato, red onion with chipotle mayo on Focaccia bread. Pulled Pork, crispy bacon, melted Swiss & cheddar cheeses, chipotle mayo & BBQ sauce on toasted Sourdough. Chicken breast, Provolone cheese, Romaine lettuce, tomato, red onion with a sun-dried tomato pesto spread on Focaccia bread. Sharp cheddar cheese melted over a fire-grilled chicken breast, crispy bacon, Romaine lettuce, tomato, red onion, with a barbeque sauce on Focaccia bread. 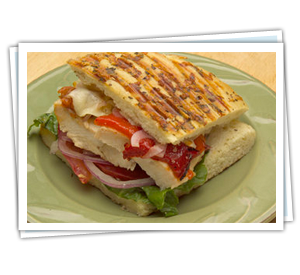 Grilled chicken breast, your choice of cheese & toppings on your favorite bread. Black Forest Ham, melted Brie cheese, thinly sliced Granny Smith apples, Apricot Honey Dijon spread on toasted Sourdough. A twist on the traditional sandwich: sharp cheddar & Swiss cheeses served with garlic herb spread on your favorite bread. Black Forest Ham, melted Pepper Jack cheese, Romaine lettuce, tomato, red onion & chipotle mayo on toasted Sun-Dried Tomato Swiss bread. Scratch-made like Mom’s - we use blocks of sharp cheddar and roasted red peppers; your choice of toppings & bread. Black Forest ham from Little Kentucky Smokehouse, your choice of cheese & your choice of toppings on your favorite bread. 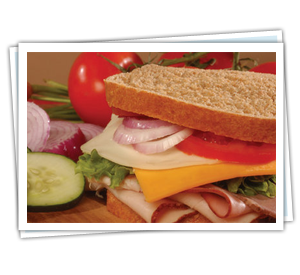 Oven roasted turkey breast, your choice of cheese & your choice of toppings on your favorite bread. 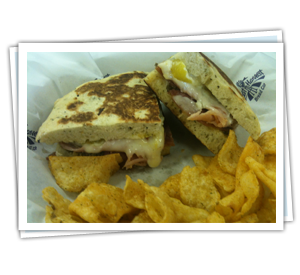 Sliced roast beef, your choice of cheese & your choice of toppings on your favorite bread. Turkey, Black Forest Ham, Bacon, your choice of cheese and toppings to create your own version of this classic sandwich. Crispy bacon, tomatoes, Romaine lettuce, mayo, salt & pepper on your favorite bread. 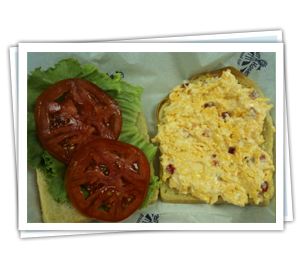 Chicken Salad "Locally World Famous"
Chunks of all white chicken, sweet & spicy pecans, seasoned mayo with your choice of toppings on your favorite bread. White Albacore tuna with seasoned mayo; your choice of toppings on your favorite bread. Artichoke hearts, Provolone & cheddar cheeses, avocado spread, hummus, Romaine lettuce, tomato, red onions, banana pepper rings on your favorite bread. Chunks of all white chicken marinated in buffalo sauce, Romaine lettuce, tomato & red onion with your choice of Ranch or Blue Cheese dressing, heated and toasted on sourdough bread. Great Harvest’s healthy version of this classic sandwich. All Natural Peanut Butter & No Sugar Added Fruit Spread on your favorite bread.